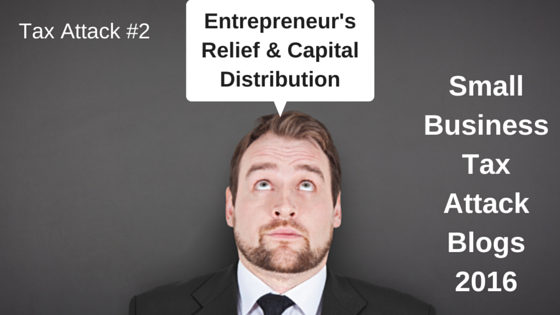 Entrepreneur's Relief & Capital Distribution Explained. Once upon a time, a sole trader could claim Entrepreneur’s Relief on the sale of the goodwill of his or her business to a limited company. And the company could also get a tax deduction for the purchase of the goodwill. It was a real tax boost for start-up companies. When both of those reliefs were suddenly withdrawn in December 2014, it marked the first chapter of George Osborne’s assault on small business. But that’s old news – what’s happening to Entrepreneur’s Relief now? Well, currently there’s some tax relief available when a company closes down. A distribution of up to £25,000 may be made to shareholders on striking off and is treated as capital for tax purposes. Where assets are more than £25,000, capital tax treatment is available but requires the company to go through a Members’ Voluntary Liquidation. But all that’s ending on 6 April. From that date, distributions on winding up will be treated as income (dividends) if the individual receiving the distribution becomes involved in a similar activity within 2 years of the date of the distribution. It might be mainly aimed at those who abuse the current rules by continually opening and closing companies, but it will also affect many entrepreneurs who have perfectly good reasons for closing down their companies. And it will certainly increase the tax haul from small business. Maybe, but watch out for the budget on 16 March. The Chancellor is rumoured to be targeting further restriction on Entrepreneur’s Relief. And Capital Gains Tax rates are sometimes seen as vulnerable to being increased. Yes, but you have to act fast. If you’ve got a lot of undistributed profit, consider closing down your company before the restrictions come into force. If there’s more than £25,000 at stake you will need to contact an Insolvency Practitioner (and they are very busy right now with companies trying to beat the deadline). Less than £25,000 and you can take care of it directly with Companies House.